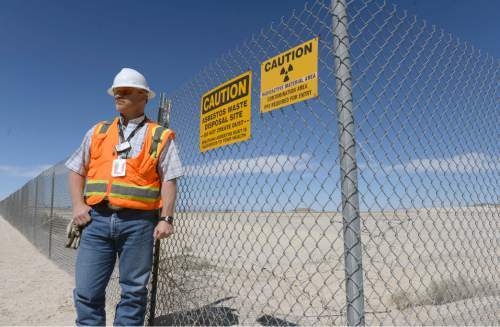 Will depleted uranium be a time bomb for future Utahns? Tooele meeting • Residents and officials try to establish what could happen down the road if the radioactive waste is buried in Clive. Scott Sommerdorf | The Salt Lake Tribune Mark Walker, vice president of marketing and media relations for EnergySolutions, speaks with Ashley Soltysiak of HEAL Utah in the hallway outside the first of two public hearings the Department of Environmental Quality is planning to hold about EnergySolutions' plan to take up to 700,000 tons of depleted uranium over 30 years. The meeting was held at the Tooele County Courthouse, Wednesday, May 6, 2015. 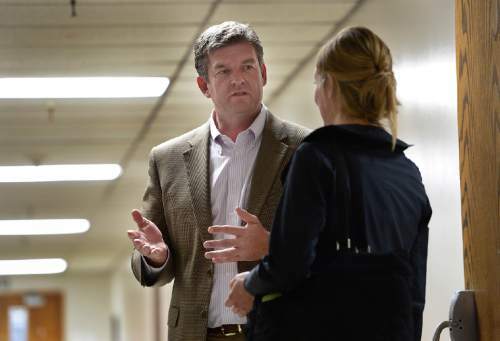 Scott Sommerdorf | The Salt Lake Tribune Mark Walker, vice president of marketing and media relations for EnergySolutions, speaks with Ashley Soltysiak of HEAL Utah in the hallway outside the first of two public hearings the Department of Environmental Quality is planning to hold about EnergySolutions' plan to take up to 700,000 tons of depleted uranium over 30 years. The meeting was held at the Tooele County Courthouse, Wednesday, May 6, 2015. Scott Sommerdorf | The Salt Lake Tribune Tooele residents listen to descriptions of EnergySolutions' plan to take up to 700,000 tons of depleted uranium over 30 years in the first of two public meetings held at the Tooele County Courthouse, Wednesday, May 6, 2015 Scott Sommerdorf | The Salt Lake Tribune Helge Gabert, center, of the Utah Department of Environmental Quality - speaks with Tooele resident Matt McCarty, left, and Chris Sloan of the Tooele County Chamber of Commerce, during the first of two public hearings the Department of Environmental Quality is planning to hold about EnergySolutions' plan to take up to 700,000 tons of depleted uranium over 30 years. 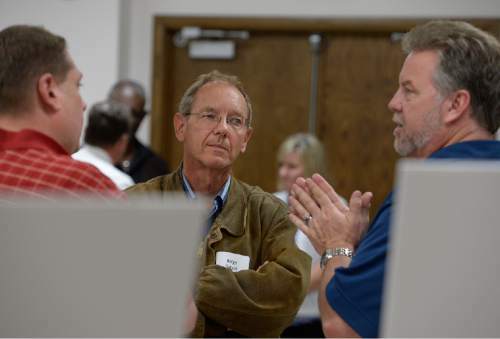 The meeting was held at the Tooele County Courthouse, Wednesday, May 6, 2015 Scott Sommerdorf | The Salt Lake Tribune Bill Thurber of SC&A - an environmental and energy consulting service - speaks with Tooele resident Matt McCarty, left, during the first of two public hearings the Department of Environmental Quality is planning to hold about EnergySolutions' plan to take up to 700,000 tons of depleted uranium over 30 years. 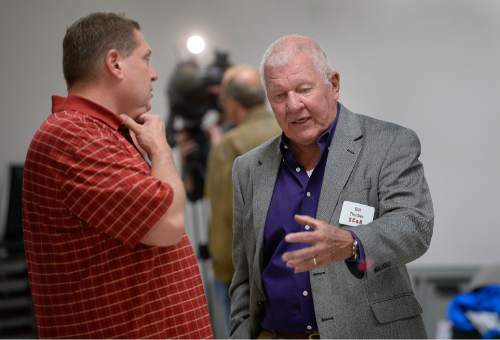 The meeting was held at the Tooele County Courthouse, Wednesday, May 6, 2015 Al Hartmann | The Salt Lake Tribune David Squires, general manager, Clive Operations for EnergySolutions, stands next to an area ready to accept large quantities of depleted uranium. The Utah Department of Environmental Quality is finalizing its regulation for how this waste will be processed. 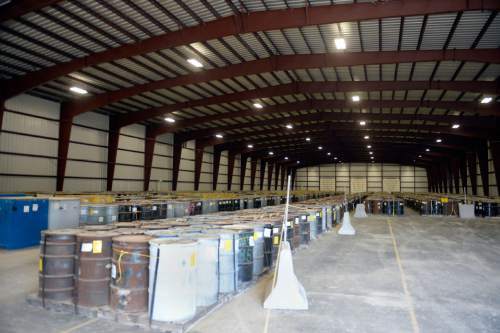 (Courtesy of David Squires, EnergySolutions) EnergySolutions is temporarily storing barrels of depleted uranium in a controlled warehouse at their Clive facility in Utah's West Desert. The Utah Department of Environmental Quality is finalizing its regulation for how this waste will be processed. It will eventually be buried in a cell at the Clive facility. Al Hartmann | The Salt Lake Tribune David Squires, general manager, Clive Operations for EnergySolutions, stands next to an area ready to accept large quantities of depleted uranium. The Utah Department of Environmental Quality is finalizing its regulation for how this waste will be processed. Tooele • The horizontal lines slicing across the mountain ranges filling the Great Salt Lake Desert tell a story of the distant past  and may also describe a likely distant future. Those shelves, carved by an ancient lake that covered much of northern Utah 14,000 years ago, now play prominently in environmental regulators&apos; decision of whether to allow up to 700,000 metric tons of radioactive waste to be buried in Lake Bonneville&apos;s high-and-dry lakebed. What will happen when  not if  this massive lake rises again and covers EnergySolutions&apos; Clive landfill, where the company hopes to soon dispose of the nation&apos;s depleted uranium (DU), the radioactivity of which increases over time? This is among the eight concerns the Utah Department of Environment Quality (DEQ) has raised about the nuclear waste handler&apos;s proposal to inter this low-level waste below grade, according to Bill Thurber, a project manager for the state&apos;s consultant, Virginia-based SC&A. "Over long term, there is going to be wind-blown deposition. 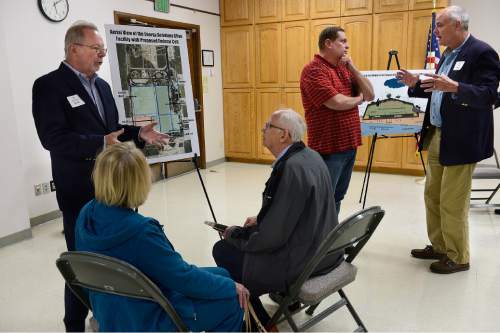 How much will build up on the repository is a number that is debatable," said Thurber at a sparsely attended public forum that DEQ held Wednesday in Tooele. 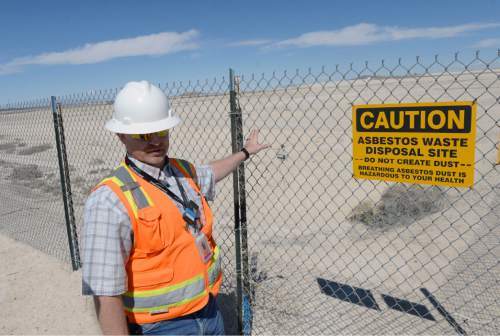 The fate of the landfill and its radioactive contents centuries from now is what concerns Tooele resident Matt McCarty, who wonders if the project is setting a timebomb by burying so much radon-generating material in one place. The valley, west of the Cedar Mountains, is dry, desolate and empty now, but that could change. "We don&apos;t know where human habitation is going to end up," McCarty said. "When the landfill is no longer maintained, it could deteriorate. The metal containers will deteriorate. The containment will not be as effective." So-called "deep-time" issues are not much of a concern for Tooele Realtor Chris Sloan, who chairs the Chamber of Commerce board. He believes technological advances over the coming centuries could lead to alternatives to DU disposal. "In that amount of time I think they could find a way to use it. I can see them digging it back up," Sloan said. But EnergySolutions&apos; "performance assessment" does not allow for speculation of what could happen. Instead, it must make science-based predictions of dose levels people would encounter should they come through the site 10,000 years from now. State law also requires a look into what could happen at the site further into the future, and that&apos;s where the return of Lake Bonneville comes in. The consultant contends EnergySolutions overestimated how much sediments would build up over the DU cell and failed to account for buildup of radon under the containment structure. EnergySolutions spokesman Mark Walker said the company expects to address all the state&apos;s concerns in the coming weeks. "We expected there would be concerns. This is a very thorough process," Walker said. "If we can&apos;t answer the eight concerns we know what the answer is. The state won&apos;t give us the permit." Another meeting will be held Thursday at the DEQ headquarters in Salt Lake City. The agency plans to re-release the performance audit once EnergySolutions resolves the technical concerns, opening a 45-day public comment period.